We are excited to announce our recent move from Grand Rapids, MI to Montague, MI. We are thrilled with the potential of the new farm and the opportunities it provides for raising alpacas in Michigan. The 60 mile relocation places Grand Alpaca Company just over one half mile from Lake Michigan and only seven short miles from US-31. We can feel and smell the lake when we step out our door and we are surrounded by the most beautiful and vibrant cherry, peach and apple orchards here on our 40 acres. The majority of our 90 huacaya alpacas were purchased from the original owners of Grand Alpaca Company, Tim and Jane Talbott. Tim and Jane have been pioneers in the alpaca farming industry within the United States for over 30 years. They have mentored us in all walks of the industry and we have developed a very close relationship, both business and personal. We are practically family! ​God has blessed our early endeavors and we commit to Him our love, joy and stewardship of His creation, both the graceful animals He has entrusted to us and beautiful countryside we so enjoy. We know that with God as our focus, He will lead Grand Alpaca Company to bigger and better things at our new location. While visiting us online, be sure to look at our Alpaca Herdsires in Michigan and our Alpacas for Sale in Michigan. 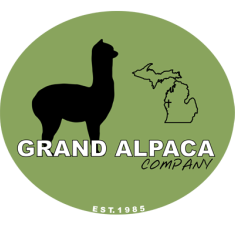 The Grand Alpaca herd was started by alpaca pioneers, Tim and Jane Talbot, in 1985 and represents 30 years of dedication and experience in raising alpacas in Michigan. These are Chilean and Peruvian huacaya alpacas bred selectively to achieve excellence in conformation, disposition, color, and fiber (density, fineness, luster, uniformity, and crimp). Through careful pedigree analysis and selection, this herd comprises an excellent gene pool and breeding program. Through superior breeding, our herd is of high quality with proven lineage, with all 16 lustrous shades of the alpaca color spectrum represented, including variations of silver-grey, rose-grey, fawn and black alpacas. Learn more about our herd of Michigan alpacas. In 1985, when the Grand Alpaca Company was established in Michigan, there were an estimated 350 alpacas throughout all of North America. According to the Alpaca Owners Association or AOA, as of 2015 there are over 243,000 registered alpacas in the U.S. The reason for such exponential growth is simple - people recognize the financial and personal benefits of alpaca ownership. Alpaca owners will tell you that alpaca ownership is its own reward. ​Learn more about the benefits of alpaca ownership on our page "Why Invest in Alpacas?" Why buy your alpacas from us? We have more than 90 alpacas to choose from, learn more about what we have to offer at our Michigan alpaca farm. Read about the guarantees and services that we offer along with the sale of our Michigan alpacas.